It would be enough if Fede, as he often goes by, came to compete in American drifting with a totally normal car. He has competed around the world, and his quick, snappy international style of driving stands out on its own here in the States. Our competition drift cars tend to have a kind of muscle car look in how they drive: slowly rotating the car into a corner and then rocketing out, nose in the air and the rear of the car squatting down on the gas, blowing off huge clouds of smoke. They could be driving Chevelles the way the rear tires look like they’re digging into the pavement. Federico doesn’t drive like that, and it’s something that’s easy to spot the moment you look for it. His car keeps its nose in the air, but also the back, too. he glides across the track, like the whole vehicle is skating an inch off the ground. That’s the other thing that you notice the first time you actually lay eyes on “Fiorella,” the nickname for the 599 itself: It is absolutely huge. 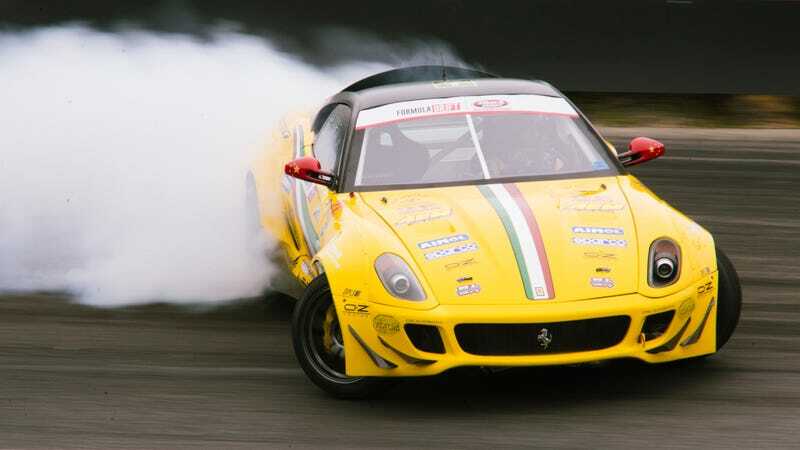 Even stock the Ferrari 599 is about as wide as a full-size pickup from the 1990s. This one has a serious widebody kit on top of that to allow for all of the steering angle a modern drift car requires, and it looks as big as a small house on track. It dwarfs the cars it runs against. Watching Federico compete, it never looks easy. The throttle is always modulating the throttle, snapping on and off the clutch. The clutch! How weird it is to see three pedals in a 599. This isn’t a stock transmission, either, but rather a Hollinger six-speed sequential transaxle, the cost of replacing I do not wish to imagine. One crew member tossed out the number $30,000, which sounds about right given that a normal Hollinger six-speed can run about $20,000. If the transaxle is $30,000, I shudder to think of the cost of the whole car altogether, and then I really stop being able to compute being able to throw the car sideways at a wall, as is standard practice in drifting, knowing that if the driver screws up or some component in the car breaks, it’s all going very wrong very quickly. Not that it has been all good for Fiorella. On its debut in the States it caught on fire. The team had 10 days to rewire the car before the next round of competition and get it straight. Still it’s missing its headlight cover on the side of the car that burned. Fede said he wanted to cut off the cover on the good side so that it would match, but he doesn’t have the heart to cut up an already working, stock Ferrari piece of the car. This season has been tough for the team. There was the fire, then the car started breaking axles, axles that were extremely difficult to replace. This weekend it broke that CV joint, and I get the feeling that, on each run, the crew wonders what might break next. They have had to work hard to make the car their own, having been originally built in Japan by the madman Daigo Saito, then reworked again in Italy. They know that there are only so many spares. A team with a Chevy LS under the hood can get speed parts from anywhere. Teams running Toyota 2JZs, even, have a support network here. The Ferrari is less lucky. But that’s part of its charm. It is so extraordinary, almost unbelievable, every time you see it run. It’s the definition of spectacular. Federico went out on his first battle in New Jersey against the much more conventional 2JZ-swapped Toyota GT86 of Ken Gushi. Fede was low on the steep 33-degree banking, away from the car-killing wall, but it was still a joy to hear the V12 cut like a dozen buzz saws up to 9,000 RPM. With each event it seems like the car is running better. A new map gave the car 600 more revs, as Allen on the Ferrari crew told me. He tells me that there’s big pressure to perform well and win, even as I tell him how nice it is even to see the car on track at all. “We need this, man,” he says under the hot East Coast sun. That’s sort of why I can’t help but love this team and root for it. A Ferrari for which being a Ferrari isn’t enough. A somehow against-all-odds supercar. A six-figure underdog.